A Reepham resident and business writer has just penned her first piece of fiction – a book for children. As a freelance marketing consultant Brenda Gostling has written articles and promotional materials for her clients over many years, but this is her first foray into the world of literature. Sister Poppy at the Front was inspired by Poppy the GoGoHare, commissioned by Norwich-based independent financial advisers Almary Green to be a First World War nurse for the GoGoHares 2018 trails being brought to Norwich and Norfolk this summer from 24 June to 8 September. The book is a collaboration between Ms Gostling and Aylsham-based artist Mik Richardson. It covers a day in the life of Sister Poppy and provides a gentle insight into some of the realities of the First World War for young readers. It was the creation of Poppy the GoGoHare that prompted Ms Gostling to carry out research into nursing in the First World War. “I found some wonderful accounts of the war, including diaries and letters home from real nurses such as Kate Luard, a nurse from Colchester,” she said. 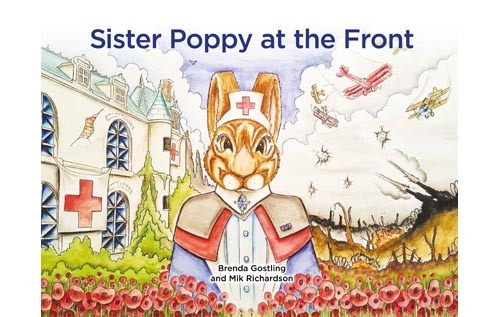 Mr Richardson, who spent 27 years in the Royal Air Force, provided the illustrations for the book: Sister Poppy is drawn as a hare and the book features other animals as her patients. He has been involved in sculpture trails across the UK including the GoGoGorillas and GoGoDragons in Norwich in 2013 and 2015. The Poppy sculpture was unveiled beside the grave of Edith Cavell in Cathedral Close, Norwich, just before Armistice Day last November. At the request of managing director Carl Lamb, Almary Green’s GoGoHare sculpture commemorates the centenary of the end of the First World War and honours the memory of all those who served in the war, both at home and on the fighting fronts. 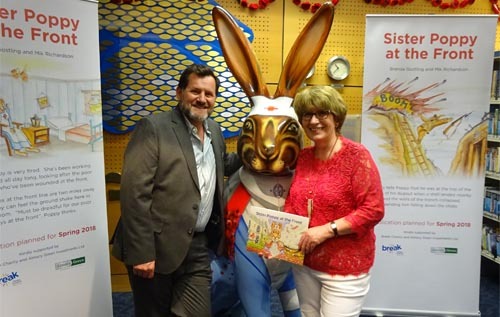 Sister Poppy’s story has the support of Norfolk children’s charity Break and the GoGoHares team. Michael Rooney, head of commercial services at Break, said: “Mik and Brenda are long-standing supporters of Break, and when we heard of the collaboration on producing a book around the sculpture Poppy, in such a memorable year, we were thrilled to support it. Almary Green is donating copies of the book inspired by its GoGoHare to every primary, infant and junior school in Norfolk. Mr Lamb, who also served in the RAF, presented copies to Jonathan Nice, a teaching and learning adviser from Educator Solutions, which sources resources for schools on behalf of Norfolk County Council, at the launch of the book in the Millennium Library in Norwich on Thursday 10 May. The launch of the book was held in the 2nd Air Division Memorial Library area of the Millennium Library. The library also hosts Norfolk’s 2018 Poppy Project, a craft project to remember all those from Norfolk who died as a result of First World War and are listed on the county’s war memorials. Poppy Project co-ordinator Sarah Salmon volunteered to host the launch. “I hope we’ll be able to organise story-corner readings of this lovely book during the summer holidays alongside some poppy-making craft,” she said. In the story, Sister Poppy originally comes from Norfolk. One of the characters in the book is her brother, Harry, loosely based on Ms Gostling’s grandfather, Harry Griffin, who served with the Norfolk Regiment and was injured in the trenches on 17 September 1916. Brenda Gostling will be reading Sister Poppy at the Front to children at Reepham Library on Saturday 26 May from 11 am – 1 pm. She will also sign copies for anyone who wishes to buy one on the day. Sister Poppy at the Front can be ordered online HERE for £6.99 plus £2.50 p&p (UK only). Alternatively, books are available for purchase in person (price £6.99) at Jarrolds, Exchange Street, Norwich; Hamptons at the Barn, Dereham Road, Bawdeswell; and Very Nice Things, Market Place, Reepham. Other stockists will be added shortly. A share of any net profits from sales of the book will be donated to Break Charity.